Don’t get Leo DeBruhl wrong — scoring makes him smile. But the sophomore guard often prefers to share the joy by setting up one of his Seattle Academy teammates to score. “It makes two people happy, me and the person scoring, rather than just me scoring,” said DeBruhl, who named the family’s two dogs after a pair of nifty passing guards, Steve Nash and Ricky Rubio. He was about 7, riding home from a Little Hoopers game, when he shared that sentiment with his Dad. “I just marveled at how he figured that out at his age,” Joel DeBruhl said. Leo has done enough scoring and passing to earn MVP honors in the Emerald City League this season and lead the fifth-seeded Cardinals (19-3) to the Class 1A state tournament this week at the Yakima Valley SunDome for only the fifth time in school history and first since 2014. He averages 16.6 points and 5.2 assists, along with 5.5 rebounds and 2.3 steals. “Whether it is basketball, ping pong or whatever, if the score is being kept, Leo is going to do everything in his power to win,” Joel said. Growing up in a sports-minded family (mom Lenni Lanfranco also played tennis and is a former sports editor, older sister Allie played DI lacrosse at Saint Mary’s and younger brother Carson plays basketball as well), Leo remembers always having some kind of ball in his hand, which his Mom confirms. In third grade he began working with basketball guru James “Fluffy” Combs, who trained former NBA players Damon Stoudamire, Salim Stoudamire and Mike Dunleavy, Jr., among others. 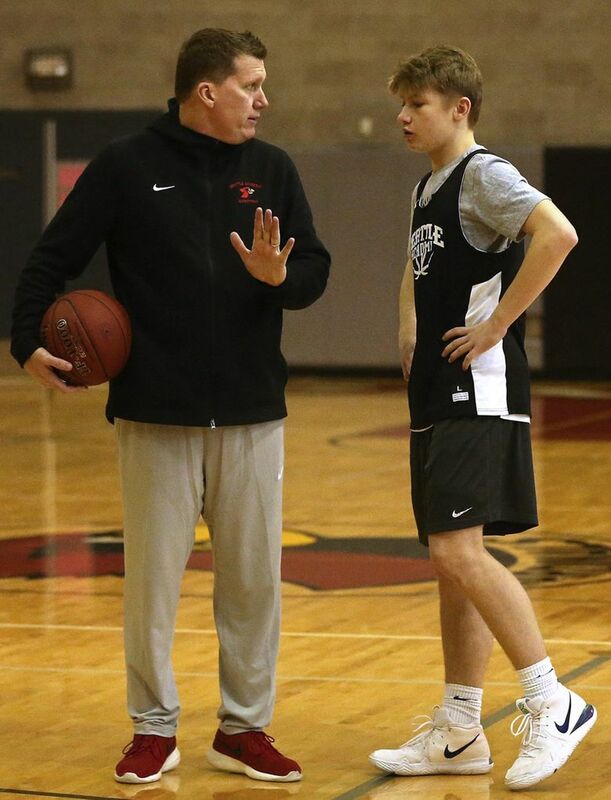 Between his own sessions, Leo loved watching from the sidelines as Combs worked with some of the area’s up-and-coming stars, including Payton Pritchard, now a starting guard for Oregon. Leo stood out at an early age. Leo eventually worked one-on-one with Pritchard, despite the five-year age difference. Leo began playing AAU in Seattle in the sixth grade, making the commute from Lake Oswego. 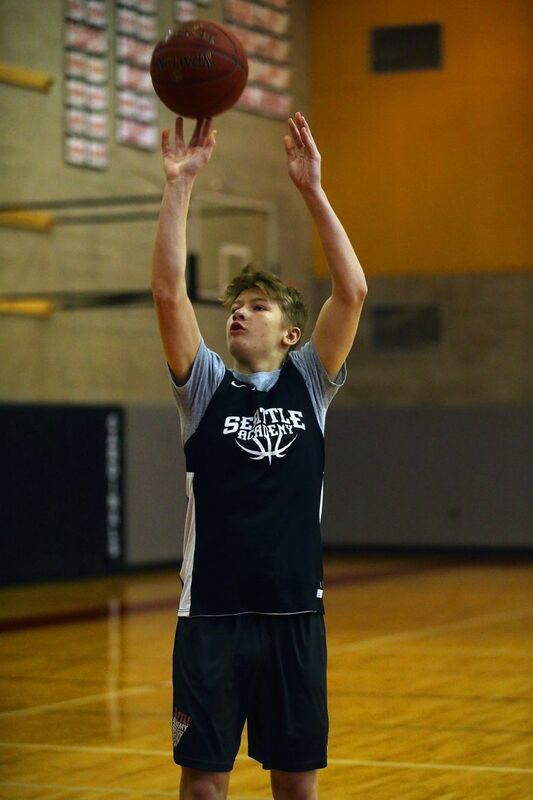 He was part of the Seattle Select seventh-grade team that finished second in the nation. When Joel got a teaching and coaching job at Seattle Academy in 2016, Lenni and the boys stayed in Oregon for a year, then moved so Leo could enroll at Seattle Academy as a freshman and Carson as a seventh-grader. Leo averaged 10.4 points and 3.6 assists as a young Cardinals squad went 8-14, losing a first-round playoff game to King’s. 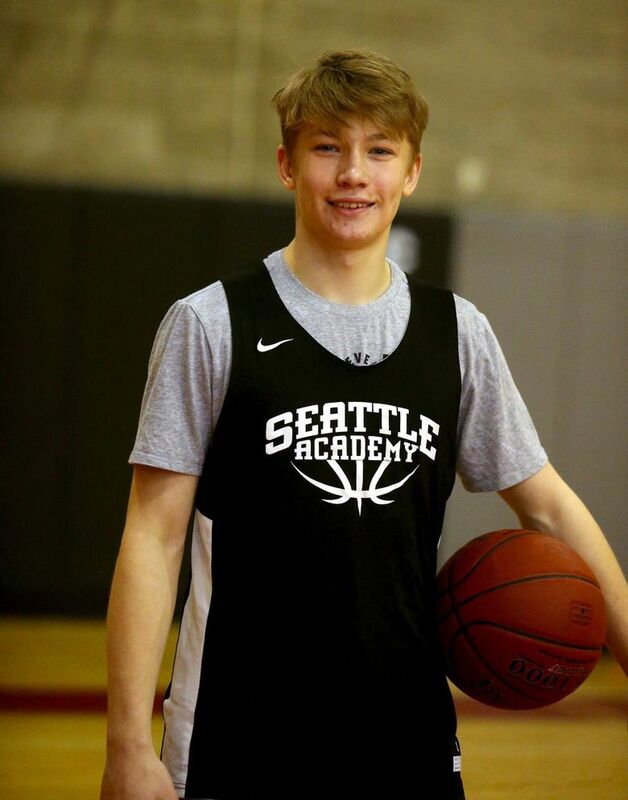 Seattle Academy achieved its goal of going through the Emerald City League unbeaten this season — despite missing DeBruhl for two games with a broken finger — and owes two of its losses to top-ranked Lynden Christian, the defending state champion. The first was by 18 points in early December and the second by 11 in the bi-district title game on Feb. 16 — a game that was close until the final two minutes. “That made us more confident going into state knowing that if we can compete with that team, we can compete with any team in the state,” Leo said. “Everyone on our team has the goal of winning a state championship, and everyone sees it as a reachable goal,” he said. Follow along: Follow @wiaawa for all teams and @SandyRinger1 for some games involving Greater Seattle area teams. Top storylines: Look for another Lynden lovefest in Yakima. The town celebrated three championships last season as the Lynden Christian boys and girls swept the 1A titles and the Lynden boys reigned in 2A (the Lynden girls placed sixth after winning the crown in 2017). All four teams are contenders again. … The second-seeded Bellevue Christian girls (21-2) are looking to rebound Wednesday after losing to No. 7 Meridian in the regional round, 40-26 — that’s less than half the Vikings’ season scoring average of 52.5. They open tournament play Wednesday at 10:30 against No. 10 Freeman (18-5). … Archbishop Murphy’s hopes of returning to the 2A championship game took a hit with the loss of senior Emily Rodabaugh, last year’s tournament MVP, to an injury earlier this season. The No. 5 Wildcats (19-4) still have some firepower but are coming off a 49-41 loss to No. 4 White River (24-3) and play a loser-out game Wednesday against No. 13 Black Hills (17-8). The No. 10 King’s boys (19-5) seek a seventh consecutive trophy after taking sixth last season (after coming in seeded at No. 16). The Knights play No. 7 Deer Park (20-3) Wednesday at 5:30. The No. 8 King’s girls (20-6) are also back and face No. 9 Medical Lake (18-6) at 2 p.m.
Five to watch: G Cole Bajema, 6-8, Sr., Lynden Christian: 1A Player of the Year in 2018 has signed with Michigan. … G Antonio Salinas, 6-1, Sr., Zillah: SCAC West MVP helped Leopards win 2017 state title and wants another one. … G Mason Landdeck, 6-0, So., Cashmere: Three-point machine averages around 30 points per game. … G Christian Zamora, 6-5, Sr., Lynden: Returning all-state player is just one of several Lynden scoring threats. … G Hailey Van Lith, 5-9, Jr., Cashmere: Her picture-perfect jump shot helps makes her one of the state’s top recruits. Favorites: 2A boys: No. 1 Lynden (23-1), No. 7 Selah (18-5), No. 3 North Kitsap (22-4). 2A girls: No. 1 Lynden (21-3), No. 3 Clarkson (23-2), No. 4 White River (24-3).1A boys: No. 1 Lynden Christian (24-0), No. 2 La Center (22-2), No. 3 Zillah (23-1). 1A girls: No. 1 La Salle (24-0); No. 4 Cashmere (21-2); No. 3 Lynden Christian (21-3). Last: One trend won’t continue in the SunDome this week with the absence of the Freeman boys, who had posted three consecutive second-place finishes in the 1A tournament. The Scotties were eliminated in the district playoffs.